Imagine: right now someone at Sotheby's is bidding many millions on a small piece of canvas. This while you can own your own architectural art work for much less. 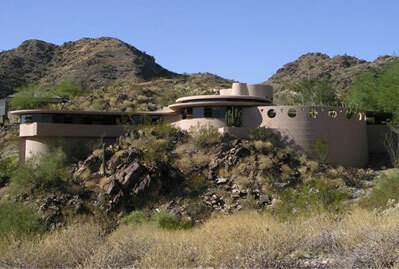 The last house Wright designed before he died in 1959, it is also one of his most artful. Totally renovated in 1997 with no expense spared, it is literally better than new! One look at the floor plan demonstrates that the structure's strengths aren't accidental. "On paper you can see how the center of the living room intersects the center of the fireplace, and the fireplace the kitchen, and the kitchen the courtyard. It's a carefully thought-out composition--not a bunch of arbitrarily placed circles." Viewed from the outside, Wright's circles are at once historical (echoing Native American kivas) and futuristic (is this the Jetsons' desert hideaway? ): the house both mimics the mountains and stands aloof, needing nothing but its own curls and swirls for satisfaction. One author described the house as a "gentle bird momentarily poised on a rock outcropping." Like Wright's most famous house, Pennsylvania's Fallingwater, this dwelling treads lightly on its site. Amazingly, its supple forms are made entirely of rectangular concrete blocks. In Wright's hands the blocks form a sculpture that is organic, nurturing and womblike. Inside, Wright's architectural pyrotechnics aren't some vain geometric exercise, but is form in the service of function. The circles create a feeling of safety but at the same time draw the eye from one point to another. There's harmony and energy." What's more, Wright the alchemist spun circles (notoriously difficult to carve into usable rooms) into spaces people want to be in. The Living Room begins with Wright's oversized hearth-a stunning use of concrete blocks that sets the concentric circle theme that ripples through the building. It is flanked by a set of Taliesin chairs (cherry wood "folded" like origami), plus a pair of '40s Fontana arte torchere from a Paris apartment. Using materials rich in color and texture, a tiny bedroom becomes a stateroom that envelops rather than crowds. The stool and small table were designed by Wright for the house; the "barrel chair" is an earlier Wright design, available from Cassina. The Kitchen is on the ground floor of a cylinder like structure. The curved design puts a surprising amount of workspace within easy reach. The appliances are high European grade and the countertop is stainless steel. The Master Suite has a 50's vanity chair, an upholstered bed by Nick Berman and a Donghia chaise. The finishes for the steam shower are in Biazzi glass and copper tiles which are hand glazed in Italy. There's also a separate high quality spa tub. A Small study computer room sits off the living Room and is lined with book shelves, a desk and a wet bar that folds away discreetly. The original design of this spectacular home had five small bedrooms which the seller redesigned into three. The smallest, noted previously, the large Master and a very spacious Guest Room with en suite bath of the highest quality fixtures and again Biazzi Tiles. The Pool area and Patio is Wright to the Max with "peek-a-boo" circle openings, providing pleasing design features and light for various cacti that bring the desert in. The pool was added by the seller to Wright specifications and is surfaced in shimmering Mother of Pearl Tiles! There's a convenient enclosed wet bar for catered pool parties. This property is located on an oversized Acre plus mountain lot in an exclusive desert setting at the end of "Palm Canyon" in the heart of the city. It has views in all directions of majestic saguaro covered mountains and the city lights below. There are miles of mountain trails for hiking right outside your door. This is one of the most beautiful canyon locations in the Phoenix metropolitan area. The location is 10 minutes to the airport and 5 minutes to the most exclusive shopping and finest dining in the Valley of the Sun. The property is surrounded by multi-million dollar homes of striking architectural designs befitting this home's pedigree. The lucky Wright aficionado that buys this property will own a true masterpiece, a one of a kind treasure that has been featured in movies, magazines, television programs and numerous Wright Books.